There are currently two hundred versions of Liszt’s Piano Sonata in B minor listed in the online ArkivMusic catalogue. Even allowing for a fair few ‘doublers’ where the same recording has been reissued or re-mastered, this is an enormously popular work with concert pianists. Emil Gryesten is up against all the ‘greats’ including Martha Argerich, Daniel Barenboim, Emil Gilels, van Cliburn and Vladimir Horowitz. Liszt’s Sonata was dedicated to Robert Schumann. It is conceived in four ‘movements’ played without a break. The method Liszt chose to maintain unity was to make use of a relatively small set of themes which are subject to constant transformation as the music progresses. Any interpretation demands huge technical resources from the pianist including tumultuous octaves at breakneck speed, a powerful exposition of melodies, accurate part-playing in the fugato sections as well as an insightful understanding of the metamorphosis of the themes that bind the work into a single massive structure. There is a need to balance drama with a breadth of vision and deep intimacy. It has been written that there is virtually every emotion known to humankind in these pages. Gryesten gives a bold, impressive and often dazzling interpretation. I enjoyed every moment of this great, romantic work. Wagner himself described the sonata as ‘… beyond all conception, beautiful, great, lovely, deep and noble – sublime.’ On the other hand, Brahms was reputed to have dropped off to sleep during a performance of this work in 1853. Apart from the inevitable Liebestraum and ‘Hungarian Dances’, my introduction to the Liszt piano music came in the form of three Années de pelèrinage. This was the Lazar Berman recording issued in 1977 (DG 2709 076). Since that time, these pieces have held my interest and although I have heard a number of pianists (Hough, Brendel, Howard) play this music, I am still a fan of Berman. The present recording presents three of the nine numbers from the Première année: Suisse (First Year: Switzerland) which was published in 1855. These were revisions of the earlier Album d'un voyageur. ‘William Tell’s Chapel’ begins with a hymn-like melody, before the pianist leads the listener into some stormy passages. The reflective mood, perhaps a consideration of the Alpine scenery, returns before the piece concludes triumphantly. It can be seen as an overture to the cycle. The heart of this Première Année is the Vallée d’Obermann which has a certain ‘Byronic gloom’ but never fails to express wonder at the ‘impenetrable grandeur of nature’. Liszt presents a scene from a romantic novel by Étienne Senancour, the ‘pessimistic, though philosophical’ French writer. It is typically romantic in mood, exploring the journey of personal transformation ‘through struggle and transcendental experience’. This is a dramatic tone-poem indeed and has been called the ‘Tristan’ of piano music. A fine performance is presented here. The final number selected from the Première Année is ‘Les cloches de Genève’ (The Bells of Geneva). It has been suggested that this piece is really a ‘nocturne’ with the bells as the underlying theme. The work is presented in an arch form, opening and closing quietly. The middle section rises to a considerable climax: it is as if the listener was sitting high on a hill hearing all the carillons of the city pealing out in some great celebration. Gryesten brings a comprehensive understanding of musical atmospherics: it is my favourite on the present CD. I am not a Wagner enthusiast as such. I guess four and five hour operas are just a wee bit too long for me. On the other hand, I have long enjoyed the orchestral extracts from his mighty operas. Add to this, the transcriptions made by Franz Liszt for solo piano. It seems to me that the Hungarian attended to all the ‘best bits’ and this is sufficient. The final scene, Isolde’s Liebestod, from Tristan und Isolde is hugely popular in its orchestral guise. Liszt has transformed this glorious music into ‘an immensely beautiful piano piece’ that works incredibly well in the recital room; one is in danger of forgetting that Wagner really contributed most of the material. The ‘Paganini Etudes’ were composed around 1838 and were inspired by a visit the violinist made to Paris in 1831. They were subsequently revised in 1851. The present Etude No.3 ‘La Campanella’ is a set of variations on the theme heard in the last movement of Paganini’s Second Violin Concerto. It is a popular character piece featuring ‘bell’ imagery as well as being a challenging technical tour de force. The pianist is required to make large octave leaps, very rapid trills and repeated notes. One author proposed that it is a ‘good study for loose wrist chords and octaves.’ Would that it were that easy. Gryesten provides all the magic and virtuosity demanded. The liner-notes by the pianist are comprehensive: they are given in Danish and English. Dates of all pieces are not given. The sound is excellent and the packaging and presentation of the CD good. Emil Gryesten was born in the Danish city of Aarhus in 1985. He studied piano playing at the Jutland Academy of Music before further work at the Royal Academy of Music in Copenhagen and the Sibelius Academy in Helsinki. Additional studies at the International Piano Academy, Lake Como with pianists William Grant Naboré, Fou Ts’ong and Tamás Vásáry have contributed to his present achievement. It is pointless to detail all the major prizes that Gryesten has collected in the past 16 years; suffice to say that this reflects his standing as an important pianist. His career began at the age of fifteen and has included recitals and concerto concerts in Scandinavia and parts of Eastern and Central Europe. Gryesten has made many studio and radio recordings. He also plays as part of the Danish Trio Vivo. His debut album was released by Danacord in 2015 (DACOCD 769) and featured music by Schubert. I had the pleasure of reviewing it. This is a great album, featuring an imaginative and essential selection of music Franz Liszt’s vast catalogue of piano pieces. I look forward to hearing further recordings from this inspired and technically competent pianist. 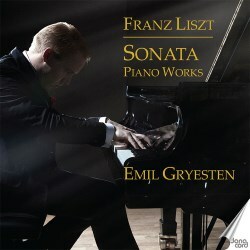 Certainly, further exploration of Liszt by Emil Gryesten would not go amiss.